Our exclusive, top-rated Elfa Door & Wall Rack system makes the most of often-wasted vertical space on a door or wall and is totally customizable. You'll love how the four baskets provide storage for spice jars, bottles of oil or vinegar, canned items and other pantry staples. Baskets can be easily repositioned to fit your storage needs, or even removed if you want to take ingredients to another area. Build your own customized solution with our Elfa Utility Door & Wall Rack Planner. When the door is closed, can the hook be seen from the outside? I would like an organizer for the pantry door (hollow core) that does not appear when the door of the pantry is closed. Yes, the small tabs of the over and under door hook that secure our elfa utility White Wire Door &amp; Wall Rack are noticeable but not overwhelmingly on the door when closed. You can also mount a Door &amp; Wall Rack using our Anchors &amp; Screws for Hollow-Core Doors for a seamless appearance. Is there one of these that will fit an 8' door? Yes, our 94-5/16&quot; elfa Mounted Standard can be used to create a 8' elfa utility Door &amp; Wall Rack solution. 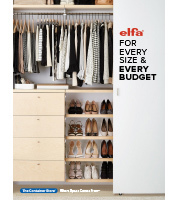 Design it yourself with our elfa utility Door &amp; Wall Rack Planner (https://www.containerstore.com/design-center/door-wall-rack) or contact us at 1-888-CONTAIN (266-8246) for further assistance. How does this work if you want to mount it on a wall rather than the door? Are there wall mounts included?